According to Warhol’s landlord, the prominent Sarasota philanthropist Alfred J. Goldstein, the “Factory” was having too many wild parties. The Factory was a fashionable New York City hangout for misfits and socialites alike. Tin foil covered the walls, even the walls of the elevator. Fractured silver mirrors were strewn across the apartment. At one point, a red couch was found by Billy Name on the side of 47th street and hauled in. It was a sight to behold, and to party in. A gallery room features four silkscreen prints of Flowers, as well as early and later works by the artist from the 1950s through 1980s that focus on floral imagery. 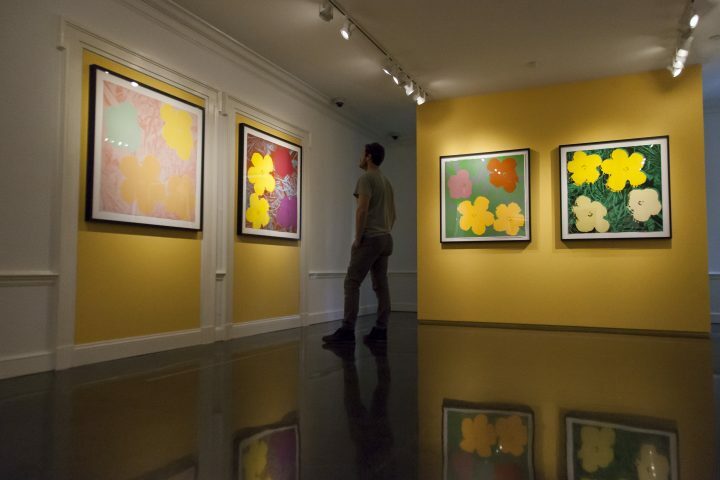 The prints are part of an impressive oeuvre of over 10,000 flowers Warhol created over his career. Though most commonly known for his obsession with fame, fashion and tomato soup, the artist had a strong passion for nature. Behind the bright paintings lived a Warhol who, though he seemed uncomfortable in nature, cherished it. Through an immersive experience, the display is a clash of the two opposing worlds Warhol loved so much, society and nature. 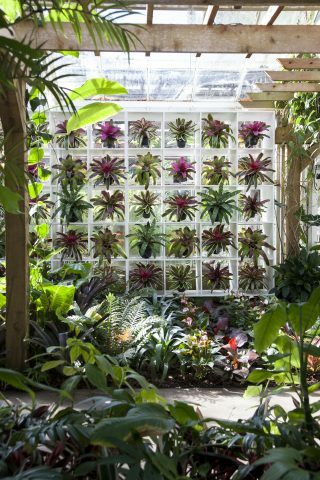 Taking over Selby’s Conservatory, Christy Payne Mansion and much of the grounds in between, it is an impressive expanse of color and pop, purporting a stark contrast of modern white furnishing and a colorful living landscape. 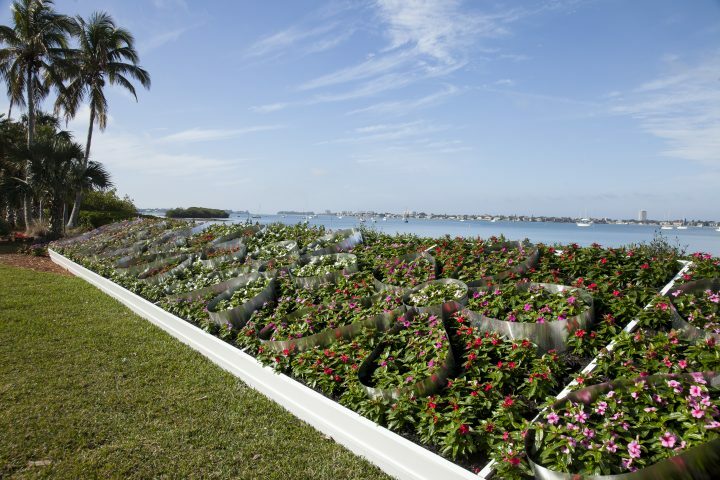 “Our team has really blurred the lines between art and nature,” Jennifer Rominiecki, the CEO of Selby, said. The conservatory’s usual dense, lush forestry has been cleared and replaced with gridded pattern of flowers. Great things don’t come in a can. As Andy Warhol knew, they come in many cans. Or in Selby’s case, they come in many, equally unnaturally curated, pots. But artificial does not equal bad. 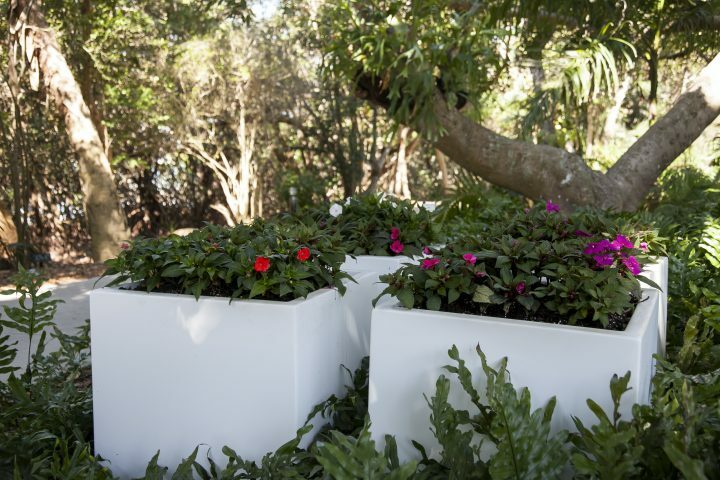 The meticulous attention to detail that is needed to oversee a horticultural project of this size and length is, Ockman suggests, just as inspiring as the work it takes to create other arts. The exhibition is reminiscent of 17th century French formal gardening, a style centered around imposing order on nature. 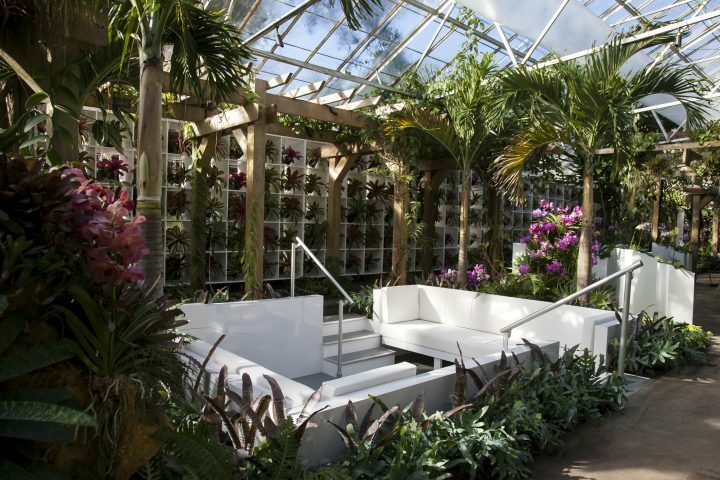 Guests are encouraged to observe a display in the conservatory from the seat of a stark white couch on a lowered platform in the middle of the conservatory. The couch creates a unnerving blank space of sterile spectatorship. It has been suggested that Warhol’s Flowers is a meditation on the ephemerality of all things. In suit with this sentiment, the exhibit itself will continue to change throughout its installation period. Due to the considerable length of the exhibit–five months–the gardens will have to routinely swap plants on display to maintain optimal appearance. 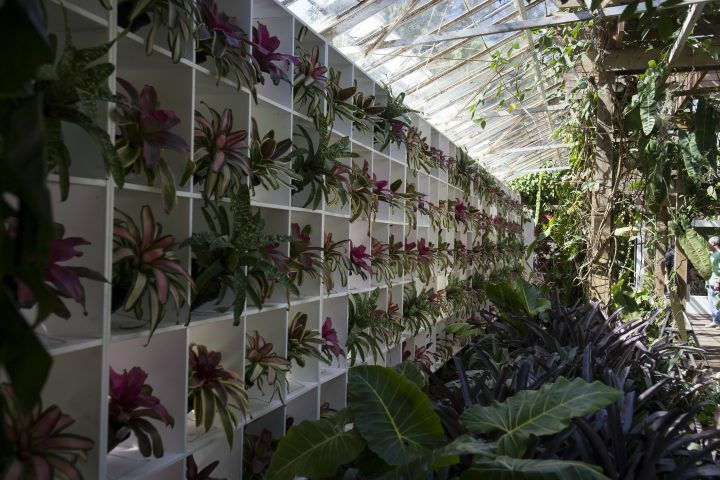 Rominiecki boasts the 600 bromeliad display is most likely the largest in the world. The exhibit stimulates one to think critically on many implications of curation. Art does not merely sit on walls, but is absorbed with the surrounding physical context. Selby’s engagement with Warhol’s work encourages viewers to consider the hibiscus in Warhol’s silkscreens as its living, breathing natural self. It is the square gridded flowers repeated over and over again in the display that brings Warhol’s ambiguous hibiscus in the paintings into coherence. But, in reality, Warhol’s hibiscus are not from nature. They’re from a reproduction of it. In 1964 a photo taken by Patricia Caulfield of an arrangement of colorful hibiscus was displayed in the an issue of Modern Photography Magazine. Warhol took this photo and cut it into a square of four flowers. He then used silk-screen printing to apply the image multiple times onto a single canvas until the flowers were unidentifiable. Approximately 300 of these prints were displayed in the original show at the Leo Castelli Gallery in 1964. More than just pretty flowers Warhol saw in nature, his Flowers series was born from a glossy magazine picture. To complicate the matter, right before the opening of Flowers, Warhol insisted a silk-screen he had just made of a photo of Jackie Kennedy after the assassination of John F. Kennedy be included with the flowers in the gallery. “How can you make art in the 60s without thinking about politics?” Ockman said. Warhol wasn’t interested in the politics of it though. What influenced him was always the effect of social royalty, of fame, on the masses. The Pop Art movement, for which Warhol is known to be apart of, is characterized by its themes of mass production and popular culture. One of the strongest influencing features of Pop Art was its acknowledgement the pervasiveness of commodification and materialism. With roots in post-WWII America, some believe the Pop Art movement aimed to challenge the divide between high and low cultures. The end of the war saw a boom in economic expansion. The post-war economy benefited from large pools of labor and new automated manufacturing technologies. While at first the Flowers series appears to be an innocuous reproduction of pretty frivolity, their backdrops of darkness and ambiguity suggest superficial beauty was not the sole aim for these pieces. Selby’s exhibit urges viewers to question notions of the natural in our everyday lives. “The show shows us nature is just as constructed as the art is,” Ockman said. Warhol: Flowers in the Factory will be on view at Marie Selby Botanical Gardens from Feb. 11 to June 30, 2018. 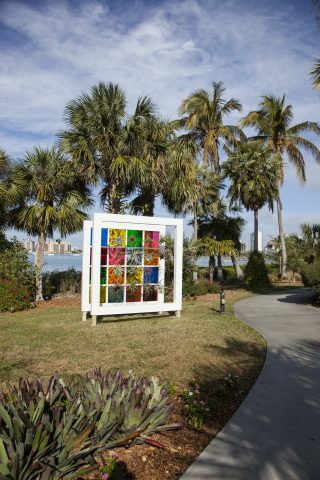 Information for this article was gathered from POPism: The Warhol Sixties and a guided tour of the Selby Gardens.